Hermit crabs are crustaceans. They have jointed limbs, claws, a hard exoskeleton, eyes on stalks, and two sets of antennae. Crabs interact with each other and are often found in large groups. Marine hermit crabs live in the ocean and land hermit crabs live primarily on land. Land crabs are more active at night and spend their days hiding from the sun. Land crabs are the ones kept as pets. 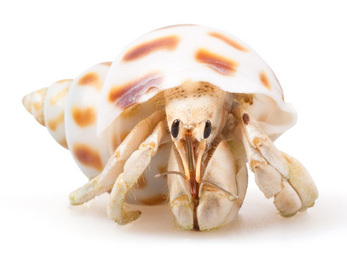 The hermit crab is not like other crabs. The hermit crab’s abdomen does not have a hard covering. To protect the abdomen, a hermit crab inhabits an empty snail shell. The shell also stores water for the crab. Hermit crabs have gills that need to remain moist in order for them to breath. There are two main types of hermit crabs available as pets. There is the purple claw crab and the Ecuadorian crab. The purple claw crab is naturally found from Florida to as far south as Venezuela and can be found miles from the ocean. It is reddish in color with dark red or purple claws. The Ecuadorian crab is found from California to Chili and lives on beaches and in tropical forests. It is smaller than the purple claw crab and is usually a brown or gray color. Hermit crabs make great pets that are fun and entertaining to watch. They are easy to care for and inexpensive. Groups of crabs tend to be more active than individual crabs since they are social animals. Caring for a few hermit crabs really isn’t any more difficult than caring for one, so having multiple crabs is not a burden and is recommended. Properly cared for pet hermit crabs can live from 5 to 15 years. They are nocturnal so you will tend to see more activity in the evening and at night. Your pets’ home can be designed with a variety of decor making it as simple, extravagant, or as realistic as you desire. Creating an amazing environment for your crab will just increase your enjoyment of these interesting animals. Care should be given while handling a hermit crab to prevent the injury of your pet or yourself. Even though crabs tend to hide in their shells when threatened, they can pinch. Picking up a crab by the shell is best for everyone’s safety. Care should also be given when your pet out of its cage. Other pets should be avoided to prevent injury or having your crab turn into someone’s meal. Crabs like to roam and climb but need to be supervised. Even though they like to climb, they are not always good at it and often fall. Keep your pet safe by not letting him climb where he could fall and be injured. Information on the supplies necessary to care for your hermit crab. Everything about feeding your pet a healthy diet. A guide to the type of home and the maintenance required for your hermit crab. Learn more about the unique anatomy of hermit crabs. All about hermit crab shells, molting, autotomy, and regeneration.